In my previous post, I described an annoying error of fact in the book I am now reading, Jim Baggott’s The Quantum Story: A History in 40 Moments. Baggott’s error was to describe the great Norwegian mathematician Sophus Lie as having lived in the eighteenth century when, in fact, Lie lived entirely in the nineteenth. Baggott may make other errors in the book, but in this case he erred on a subject I know something about. I don’t know much. I do know Lie theory. If I were to list my areas of expertise, included would also be the New York Giants professional football team of the late 1950s and early 1960s. Imagine my dismay, then, when I stumbled on an error about the Giants just minutes after the Lie biographical error. No, not in The Quantum Story. The Lie error had so bugged me that I had put the book aside. Moments later, the mailman dropped testerday’s mail in our slot. I got up, brought it in, was delighted to find the new issue of The New York Review of Books, and began reading Nicholas Lemann’s review of Howard Cosell: The Man, The Myth, and the Transformation of American Sports, a new book by Mark Ribowsky. (If you follow the link to Lemann’s review, you’ll discover that it’s behind a paywall. Sorry.) The following passage stopped me dead. Big-time sports is deeply woven into the texture of American society. They evolve in tandem. Can anybody name the heavyweight boxing champion of the world? Boxing still exists, but it has begun to feel like a cultural artifact from the vanished heyday of the American working class. Football is much more distinctively American than boxing—attempts to export it have mainly failed—and its triumph in popularity and commerce over all other sports is a little mysterious. The heavily armored players are hard to see, it’s violent, the action is highly sporadic, and the teams play fewer games than in any other major professional sport. Whatever the reason for its success, to maintain its position football has to absorb all the main currents of the culture as they present themselves. David Halberstam was killed in an auto accident while on his way to interview Y.A. Tittle, the New York Giants quarterback in the 1958 National Football League` championship game against the Baltimore Colts, a muddy cliffhanger known as “The Greatest Game Ever Played.” Halberstam’s book on the game, had he lived to write it, would surely have noted that the great majority of the players were white, grimly determined, and not very well paid (their number included Howard Cosell’s future broadcasting partner Frank Gifford). Today fewer than a third of NFL players are white, though whites still dominate some positions, like quarterback and kicker. Star quarterbacks can make more than $10 million a year. Linemen are enormous three-hundred-pounders, receivers have sculpted, tattooed bodies and do flashy little dances in the end zone when they score touchdowns, and stadiums are filled with luxurious touches like indoor box seats for high rollers. The exciting pass, not the dutiful run, dominates the game. Coaches use the latest information and communications devices to decide which plays to run and to get them to the players on the field. Everything that happens in American popular culture, marketing, ethnicity, and technology seems to manifest itself on the field. Did you catch the error? Geez. I mean, we’re talking about one of the four or five most famous games in the history of professional football. Maybe no longer considered the greatest, but among them. I might put Super Bowl III up there with it in terms of impact on the sport’s history. Even if one wasn’t there, even if one didn’t watch it or a tape of it, even if one doesn’t even care, it wouldn’t take a lot of effort to check whether Y.A. Tittle was actually the Giants’ quarterback that day. I can assure you that he wasn’t. In fact, he wasn’t even on the team. 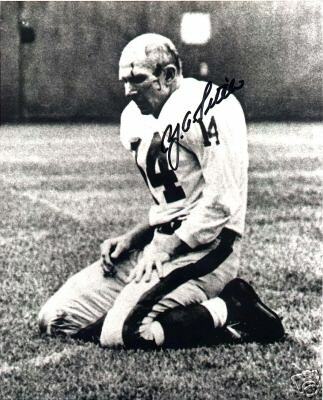 He played for the San Francisco 49ers through the 1960 season, joining the Giants for the 1961 season and then leading them to three consecutive championship games, losing to the Packers in 1961 and 1962, the Bears in 1963. I don’t need to look this up. I lived it, following every moment of every Giant game in those days, glued to the radio as Marty Glickman* called them, most memorably Tittle’s seven touchdown pass game. But one doesn’t need to live it. One can look it up. Given the ordinarily reliable Lemann’s apparent ignorance of football history, he should have. *I knew nothing then of Glickman’s own story, as a member of the US 4×100 relay team in the 1936 Berlin Olympics who the US team decided to keep out of the race to avoid offending Hitler, Glickman being Jewish.